For the second time this month, the FDA has given an approval to Genentech’s PD-L1 inhibitor, Tecentriq. The drug affordability rating in the National Comprehensive Cancer Network (NCCN) Evidence Blocks are inconsistent with real-world total episode of care costs, according to Scott D. Ramsey, MD, PhD, Director, Institute for Cancer Outcomes Research, Fred Hutchinson Cancer Research Center, Seattle, WA. He presented the results of a recent analysis at ASCO 2018. Two new clinical trials with overall survival (OS) as the primary end point establish pembrolizumab (Keytruda) as a front-line standard of care in patients with non–small-cell lung cancer (NSCLC). The results were presented at ASCO 2018. As knowledge of lung cancer tumor cell biology has evolved, small-molecule drugs that target specific genetic mutations offer oncologists the opportunity to treat patients with NSCLC in a personalized fashion. Chicago, IL—Alectinib (Alecensa), a next-generation anaplastic lymphoma kinase (ALK) inhibitor, was called a new standard of care for patients with ALK mutation–positive non–small-cell lung cancer (NSCLC), based on results of the phase 3 ALEX clinical trial, which were presented at the 2017 ASCO annual meeting. Chicago, IL—Osimertinib (Tagrisso) extends progression-free survival (PFS) compared with standard chemotherapy in patients with EGFR T790M mutation–positive non–small-cell lung cancer (NSCLC) who have central nervous system (CNS) metastases, reported Marina C. Garassino, MD, Thoracic Oncology Unit, Medical Oncology Department, Fondazione IRCCS Istituto Nazionale dei Tumori, Milan, Italy, at the 2017 ASCO annual meeting. Dr. Edward Garon discusses the importance of smoking cessation programs for patients diagnosed with lung cancer. 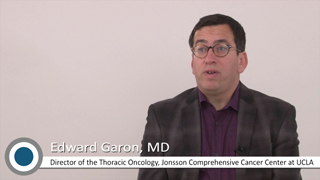 Dr. Edward Garon talks about the best approaches for screening patients for lung cancer. Who Should be Screened for Lung Cancer? Dr. Edward Garon identifies the target population for lung cancer screening. Dr. Edward Garon provides an overview of the most common presenting clinical features in adults with non-small cell lung cancer (NSCLC).